Notable birds from last year: Whitethroat was a new one for the garden list; a fine male Red-backed Shrike at Barnes WWT was a real treat (and incidentally a London tick). A Glossy Ibis was the first I’d seen in Britain although I didn’t get great views of it. Bonaparte’s Gull — an American species — was a first for me, although it was a distant bird in winter plumage that had to be pointed out to me, so it was nice but not as exciting as it could be. I picked up the two ‘other buzzards’ this year: Rough-legged Buzzard, which was a new species for me, but came with just enough niggling doubt that I didn’t enjoy it as much as I might have. Firstly because it was in May, which is pretty late for RLB, although by no means ridiculous. And also because I had good but brief views, which gave me time to note down enough key ID features to count it as RLB but not quite all the details I would have wanted, ideally, to tick a new species. In this case, I noted the wing and tail pattern carefully but didn’t make a mental note of any markings on the chest and belly… and it’s amazing how, even a few seconds after seeing something, if you didn’t consciously pick out a relevant detail, there’s no way you can recover it from memory. Birdwatching really undermines your faith in the idea of eye-witness testimony. The other other buzzard, by contrast, was the ideal sighting. It was a Honey Buzzard which was spooked up into the air by a passing Common Buzzard, so the two of them were flying around together for a minute or so, giving me the chance to make a direct comparison of size, shape, and behaviour; and gratifyingly, my mental notes matched up pretty perfectly with the ID features listed in the book. Very satisfying. And that was a British tick for me, although I have seen Honey Buzzard before in France. 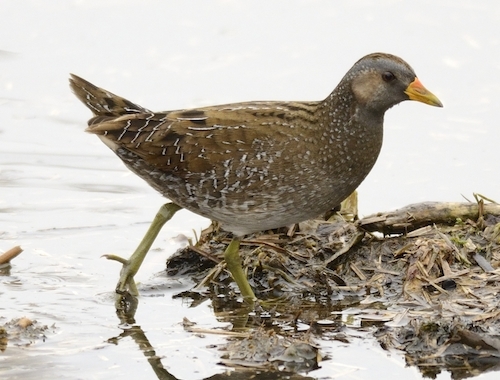 But my bird of the year for 2013 was Spotted Crake; a new species for me, an attractive bird, and one which showed well — after a long and patient wait for it to show itself. I’ve spent a lot of time staring into ditches over the years, and it doesn’t always pay off; but this time it did. » That’s not my photo, sadly. It is © Noel Reynolds and used under a CC-by licence. You can see a photo of the actual individual bird I saw at this post, if you want, but I needed a CC-licensed photo.